The hexagonal crystal family consists of the 12 point groups such that at least one of their space groups has the hexagonal lattice as underlying lattice, and is the union of the hexagonal crystal system and the trigonal crystal system. There are 52 space groups associated with it, which are exactly those whose Bravais lattice is either hexagonal or rhombohedral. The hexagonal crystal family consists of two lattice systems: hexagonal and rhombohedral. Each lattice system consists of one Bravais lattice. In the hexagonal family, the crystal is conventionally described by a right rhombic prism unit cell with two equal axes (a by a), an included angle of 120° (γ) and a height (c, which can be different from a) perpendicular to the two base axes. The hexagonal unit cell for the rhombohedral Bravais lattice is the R-centered cell, consisting of two additional lattice points which occupy one body diagonal of the unit cell with coordinates (​2⁄3, ​1⁄3, ​1⁄3) and (​1⁄3, ​2⁄3, ​2⁄3). Hence, there are 3 lattice points per unit cell in total and the lattice is non-primitive. The Bravais lattices in the hexagonal crystal family can also be described by rhombohedral axes. The unit cell is a rhombohedron (which gives the name for the rhombohedral lattice system). This is a unit cell with parameters a = b = c; α = β = γ ≠ 90°. In practice, the hexagonal description is more commonly used because it is easier to deal with a coordinate system with two 90° angles. However, the rhombohedral axes are often shown (for the rhombohedral lattice) in textbooks because this cell reveals 3m symmetry of crystal lattice. The rhombohedral unit cell for the hexagonal Bravais lattice is the D-centered cell, consisting of two additional lattice points which occupy one body diagonal of the unit cell with coordinates (​1⁄3, ​1⁄3, ​1⁄3) and (​2⁄3, ​2⁄3, ​2⁄3). However, such a description is rarely used. The hexagonal crystal family consists of two crystal systems: trigonal and hexagonal. A crystal system is a set of point groups in which the point groups themselves and their corresponding space groups are assigned to a lattice system (see table in Crystal system#Crystal classes). The trigonal crystal system consists of the 5 point groups that have a single three-fold rotation axis, which includes space groups 143 to 167. These 5 point groups have 7 corresponding space groups (denoted by R) assigned to the rhombohedral lattice system and 18 corresponding space groups (denoted by P) assigned to the hexagonal lattice system. The hexagonal crystal system consists of the 7 point groups that have a single six-fold rotation axis. These 7 point groups have 27 space groups (168 to 194), all of which are assigned to the hexagonal lattice system. Graphite is an example of a crystal that crystallizes in the hexagonal crystal system. The trigonal crystal system is the only crystal system whose point groups have more than one lattice system associated with their space groups: the hexagonal and rhombohedral lattices both appear. The 5 point groups in this crystal system are listed below, with their international number and notation, their space groups in name and example crystals. The point groups (crystal classes) in this crystal system are listed below, followed by their representations in Hermann–Mauguin or international notation and Schoenflies notation, and mineral examples, if they exist. Hexagonal close packed (hcp) is one of the two simple types of atomic packing with the highest density, the other being the face centered cubic (fcc). However, unlike the fcc, it is not a Bravais lattice as there are two nonequivalent sets of lattice points. Instead, it can be constructed from the hexagonal Bravais lattice by using a two atom motif (the additional atom at about (​2⁄3,​1⁄3,​1⁄2)) associated with each lattice point. Quartz is a crystal that belongs to the hexagonal lattice system but exists in two polymorphs that are in two different crystal systems. The crystal structures of α-quartz are described by two of the 18 space groups (152 and 154) associated with the trigonal crystal system, while the crystal structures of β-quartz are described by two of the 27 space groups (180 and 181) associated with the hexagonal crystal system. 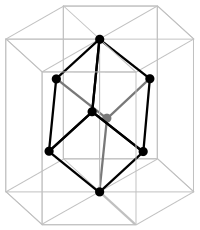 The lattice angles and the lengths of the lattice vectors are all the same for both the cubic and rhombohedral lattice systems. The lattice angles for simple cubic, face-centered cubic, and body-centered cubic lattices are π/2 radians, π/3 radians, and arccos(-1/3) radians, respectively. A rhombohedral lattice will result from lattice angles other than these. ^ a b Dana, James Dwight; Hurlbut, Cornelius Searle (1959). Dana's Manual of Mineralogy (17th ed.). New York: Chapman Hall. pp. 78–89. ^ "Page not found - QuantumWise". quantumwise.com. ^ "Medium-Resolution Space Group Diagrams and Tables". img.chem.ucl.ac.uk. ^ Ashcroft, Neil W.; Mermin, N. David (1976). Solid State Physics (1st ed.). p. 119. ISBN 0-03-083993-9. ^ Pough, Frederick H.; Peterson, Roger Tory (1998). A Field Guide to Rocks and Minerals. Houghton Mifflin Harcourt. p. 62. ISBN 0-395-91096-X. ^ Hurlbut, Cornelius S.; Klein, Cornelis (1985). Manual of Mineralogy (20th ed.). pp. 78–89. ISBN 0-471-80580-7. ^ "Crystallography and Minerals Arranged by Crystal Form". Webmineral. ^ "Crystallography". Webmineral.com. Retrieved 2014-08-03. ^ "Minerals in the Hexagonal crystal system, Dihexagonal Pyramidal class (6mm)". Mindat.org. Retrieved 2014-08-03. ^ Jaswon, Maurice Aaron (1965-01-01). An introduction to mathematical crystallography. American Elsevier Pub. Co.